House Minority Leader Nancy Pelosi (D., Calif.) sent out a fundraising email for the Democratic Congressional Campaign Committee Friday with a subject line saying special counsel Robert Mueller is "fired." By clicking on the email, readers could learn that President Donald Trump has not actually fired Mueller. Pelosi instead registered outrage at the speculation that Trump may get rid of him. "I'm so furious I can barely write this email," Pelosi started. Then she criticized her fellow members of Congress in the Republican Party for "helping" Trump fire Mueller. "President Trump is inches away from firing Robert Mueller and derailing the entire Russia investigation. And my Republican colleagues are actively HELPING him," the email continued. She said she needs a massive fundraising surge to send the message that if Republicans let Trump fire Mueller, "we'll kick each and EVERY one of them out of office." 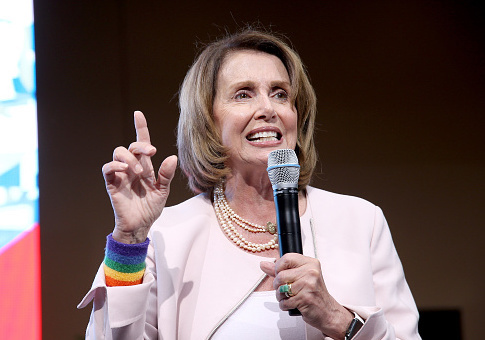 Pelosi preceded her donation request by claiming, "Robert Mueller’s our only hope for justice — and we’re the only ones who can protect him." The DCCC sent an update email later on Friday hammering the same issue, starting with "We're PULSING with rage." "This is a coordinated effort to shield Trump from justice. We can’t stand for it," the email said, asking for another contribution. Journalists at left-leaning outlets Vox and MSNBC registered criticisms of the email. This entry was posted in Politics and tagged DCCC, Fundraiser, Nancy Pelosi, Robert Mueller. Bookmark the permalink.